NOTE: Information good as of 7/31/2015 and is subject to change! 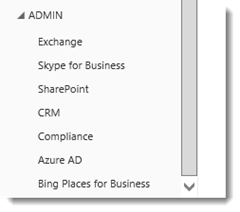 The display of Power BI under the ADMIN area within the Office 365 Navigation bar is based on the licenses you have assigned to your user account. If you have either Power BI (Free) or Power BI Pro assigned to your account, you will not see Power BI under the ADMIN area of the Navigation bar. Without the Power BI (Free) or Power BI Pro license, and having the old Power BI for Office 365 license assigned, you will see the following. 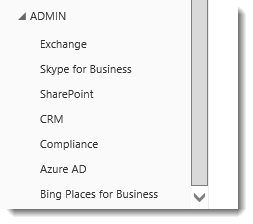 Power BI Admin Center is not part of the new service offering. It is part of the old Power BI for Office 365. So, if you assign a license for the new service, we hide that within the ADMIN area. Power BI Admin Center is still usable and available if you have the Power BI for Office 365 license assigned to your user. 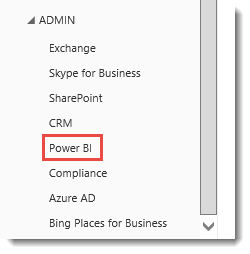 You can reach the Power BI Admin Center using the following URL.